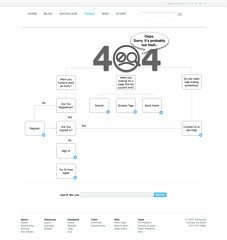 Ever click on a link and end up on a 404 page? Everyone has–it is one of those little frustrations that we endure on the net. That’s why it is a good idea every once in a while to check out the links on your own blog. Some suggest that it be done once a month at least since search engine like Google supposedly downgrade or penalize your site if you have too many broken ones. Another good reason to take care of it is for your readers. I was recently surprised to find that a good number of the links on my ‘Getting Started’ page no longer worked. Not only did I have to get rid of the broken links but in this case find new articles to replace the issues I was trying to cover on that page in the first place. Actually I was just scratching the surface. Anyone who has been blogging for a while has far more broken links in the archives than one would ever suppose. One thing to keep in mind, anytime you link to an online newspaper, magazine, or news source site after about a month or so they stuff it into their archives and the links you used no longer work. Now what do you do—actually what can you do? What does it do? Once installed it finds every single broken link on your blog and makes it possible to correct them all. Actually an incredible plugin. Each bad link can be edited or unlinked directly from your dashboard on the ‘Broken Link Checker’ page without manually having to go to and edit each individual post or page separately. I had 46 broken links on this blog but it only took a half an hour to correct it all—amazing. The only draw back is this— When the plugin is first activated it sort of locks up the backend for a while till it goes through your entire blog and finds all of the bad links. I found it difficult to do anything else with the blog till it was done. In the case of this blog it took nearly 10 minutes or so. It was much longer for my news commentary site which ended up having 135 broken links. What was really great—after I fixed all the broken links the home page actually loaded way faster than it did before. Update: After using it for a week I found that the backend continues to lock up each time I go to the dashboard and you really can’t do a thing until the Broken Link Checker checks for bad links. It’s no big deal on some of my smaller blogs but those with several hundred posts take way to long to load and resolve. Solution: I deactivated the plugin and will turn it on at least twice a month to correct any broken links. *See some of the articles below for more on this issue–Xenu Link Sleuth is another program that some recommend.